Cover Girl of Apron.ology 2013!!!!! 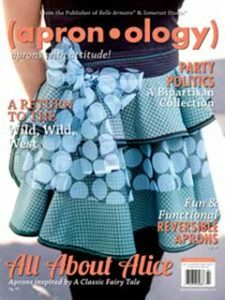 What a surprise to find out that I am not only the COVER GIRL of Apron.ology 2013, I was featured in the magazine and my political aprons were also featured on the cover story line: Party Politics: A Bipartisan collection. I was so overwhelmed with Joy. I had sent these aprons minutes before the deadline. My loving father had fallen sick and I was on my way to Florida to tend to his health. I was noted that something special was happening by the magazines but I was so distressed I did not pay attention. I got to give my dad a copy before his passing and he was proud. Though I got my sewing skills and displince from my mother, my creative artistic talent was a loving skill he encouraged and passed on to me.